Golf enthusiasts have the chance to play their favorite game while supporting Emory Eye Center’s research on Friday, August 24. The Arnold E. Gardner Memorial Golf Tournament is in memory of Arnold Gardner, who began treatment for ocular melanoma at Emory Eye Center in 2004. The tournament will be at St Ives Country Club in Johns Creek, Ga., with a 1:30 p.m. shotgun start time. Men, women, and juniors of all handicaps are invited to participate. A cookout will follow at 6 p.m. Proceeds from the tournament will benefit Emory Eye Center’s ocular melanoma research. Peggy Moloney [story, "Eye to eye," linked below]. "Eye to eye: He was the one I wanted to see," 2014 Emory Eye Magazine, p6. 2018 marks the fourth year of the tournament. Gardner and his mother Stephanie hope to use the event to educate people about the disease and possible prevention. 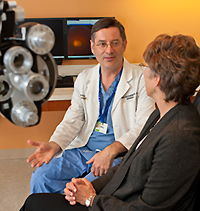 Emory Eye Center’s director of Ocular Oncology and Pathology, Hans Grossniklaus, MD, MPH, has spent years studying ocular melanoma and ways to help patients. “We’re also working on a new design of radioactive plaques which we use to treat the primary melanoma in the eye,” he adds. Members of St Ives Country Club can enter the tournament and enjoy the cookout for $85; the cookout-only fee is $25. Visit the Arnold E. Gardner Memorial Tournament page to sign up. The non-member participation fee is $150; call the St Ives Golf Shop at 770-623-1239, ext. 1111, for information or to register.